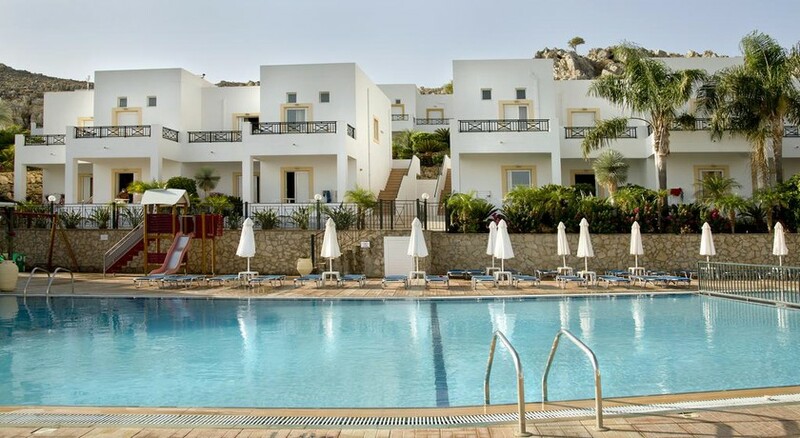 Lambis Studios is a self-catering 4-star apartment complex located at the top of Lindos very close to St. Paul’s bay and the Lindos town centre. The recently built complex has studios and apartments spread over 6 blocks surrounded by landscaped gardens overlooking the swimming pool area. The hotel arranges BBQ nights at its snack bar. As many as 46 fully furnished luxury apartments welcome guests for a comfortable stay with satellite TV, en suite shower bathroom and balcony and kitchenette facilities. There is a foreign exchange desk for the convenience of guests. With warm Greek hospitality, the hotel makes guests feel at a home away from home while on their sunny Lindos holiday. The apartment complex located at the top of Lindos very close to St. Paul’s bay and the Lindos town centre. St Pauls Bay is lovely bay just south of Lindos located on the southeast coast of Rhodes. As the lore goes, apparently St Paul disembarked here in year 51 AD to preach Christianity to the Rhodians. Till date the small church atop the hill remains very popular wedding location, with amazing views of the bay and Lindos Acropolis. The larger beach towards the southern end is a manmade beach with golden sand. And the smaller beach at the northern end of the bay is a mix of sand and gravel. The beaches have good tourist facilities, such as sun loungers, sun shades, toilets and a café. There is parking facility close by. The beaches attract for their remarkable beauty yet being not populated by tourist crowds. Watersports like snorkelling and diving are available. The Lindos Acropolis is just 1km from the property. Distance to Faethon Association Rhodes is 16.6km. The nearest airfield is Rhodes International Airport 35km away. Lambis Studios has 46 fully furnished luxury apartments. The spacious rooms are spread over 6 blocks. The air conditioned guest rooms come with safe box, balcony, satellite TV, toaster, fridge, kettle, en-suite bathroom with hair dryer and six days cleaning service. There is six days cleaning service in the room. There are balconies which provide excellent views. The apartments and studios at Lambis Studios are supposed to be self-catering. Hence a furnished kitchenette with toaster, fridge, kettle is provided to guests cook their own food. There is a snack bar serving drinks and light bites and the hotel where BBQ nights are organized. Good cafes and restaurants are nearby. Lambis Studios has a swimming pool and lovely gardens. There is Yoga classes and a fully equipped gym for those who wish to stay active. There is a pool table for guests to play. There is a lovely bar where guests can relax with cocktails. Tiny tots can have fun at the gardens, kid’s pool or Playground. Pets are allowed upon request. There is BBQ nights at the snack bar.